The goal of the study was to simulate twitch strength and neuromuscular block produced by nondepolarizing muscle relaxants. Methods: In the proposed model, affinities of the two binding sites at a single postsynaptic receptor for acetylcholine (A) and the muscle relaxant (D) define the formation of three complexes with A only, three complexes with D only, and two complexes with both A and D. Twitch strength was postulated to be a function of the receptors with both binding sites occupied by A, and two constants. Neuromuscular block (NMB) was calculated from NMB=1-twitch. Results: Stimulus-induced release of A results in rapid, but transient, changes in the concentrations of free A, the eight complexes, and the unoccupied receptors. Muscle relaxants that display either a congruous or an inverse pattern of affinities for the binding sites relative to those of A produce NMB vs. [D] curves with slightly different slopes but markedly different estimates for IC50. Depending on the number of activated receptors at the end plates of muscle fibers, the simulations represent the distributions of contracting fibers in a whole muscle. 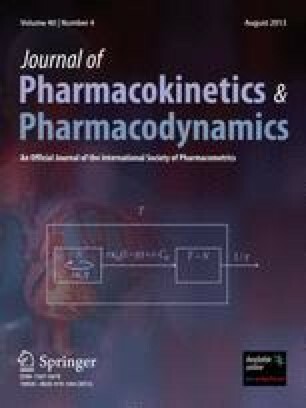 Conclusion: Simulations of competition between A and D for binding to two sites at a receptor reveal that the potencies of muscle relaxants, defined by IC50, and the slopes of the NMB vs. [D] curves depend on (1) the affinities of D for the two binding sites, (2) the orientation of the affinities relative to those of A, and (3) the affinities of A for the same two sites.